We have an Exchange 2010 SP3 Hybrid setup with Office 365 and have directory synchronization turned on. We tried to enable email archiving for a migrated user in the cloud using the Exchange Control Panel. The proper way to enable archiving for a user, you need to do this from the on-premise side as shown in the screen shot below. 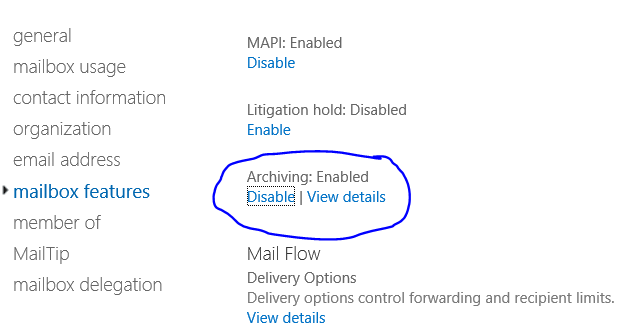 Once you have enabled the Hosted Archive, you’ll need to sync the changes. From the on-premise directory synchronization server, run a directory sync. You will see from the results of the directory sync, the msExchArchiveStatus attribute has been modified. Looks a handy thing to have thanks.